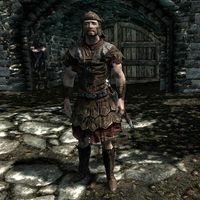 Imperial Guards are guards that can be found in Riften, Winterhold, Dawnstar and Windhelm when the Imperial Legion takes over their respective Hold and they act as the military and police force throughout that Hold. 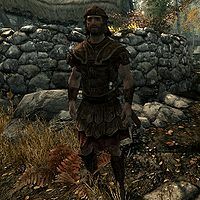 Each guard wears a set of Imperial Light armor, or a set of Studded Imperial armor, an Imperial Light helm, Imperial Light bracers, and Imperial Light boots. Each is armed with an Imperial sword, an Imperial bow, a random number from twelve to twenty steel arrows and a steel dagger. They all carry a set of common clothes. In addition they may carry from one to all of the following: a torch, a food item, and a small amount of gold. Their primary skills are one-handed, two-handed, archery and block (although they carry no shield.) Their secondary skills are heavy armor and light armor. These Imperial Guards are guards that can be found in Ivarstead and Shor's Stone when the Imperial Legion takes over the Rift. This page was last modified on 9 March 2018, at 03:00.